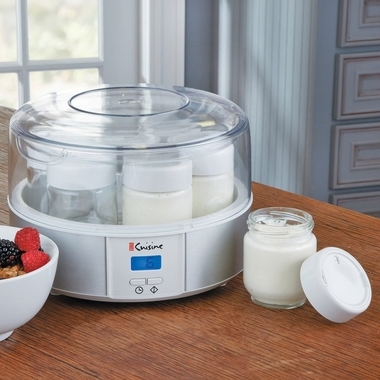 The Euro Cuisine YMX650 Digital Yogurt Maker prepares all-natural, rich and creamy yogurt. The Euro Cuisine Yogurt Maker YMX650 allows you enables control over ingredients, thickness sweetness, and fat content. You can make up to 42 ounces of yogurt at a time using its seven, 6oz glass containers. The glass containers include a clear lid for viewing of the cooking process. Make up to seven different types of yogurt at once with seven date setting lids. Seven 6-ounce Glass Jars with Seven date setting lids.